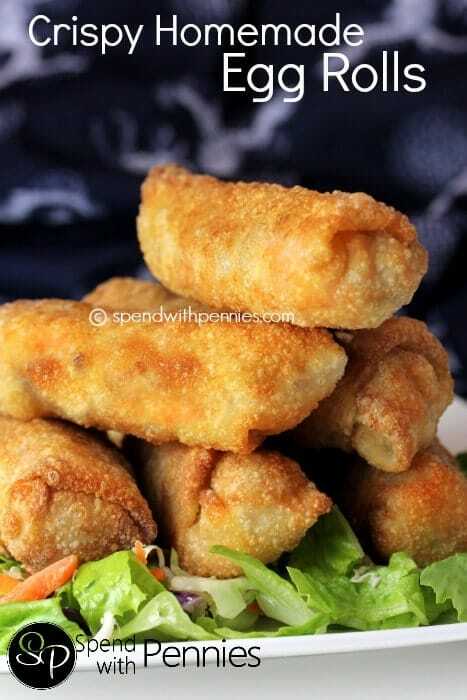 Homemade Egg Rolls are a favorite around here, when we go for dinner, egg rolls is one of my favorite things to order! 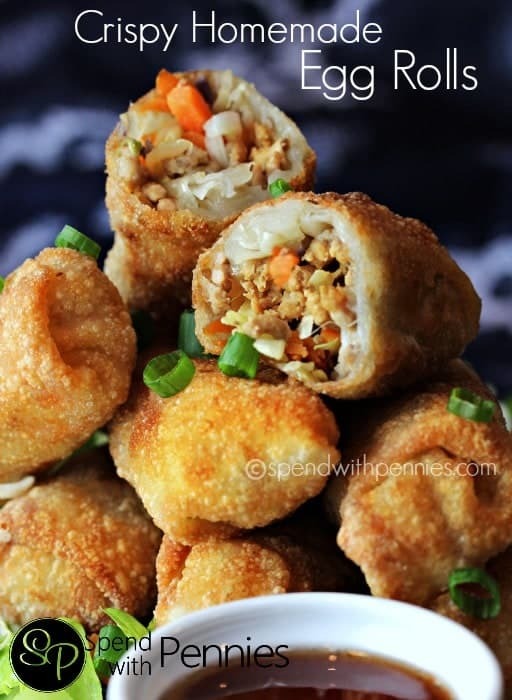 Making egg rolls is easy so easy and everyone loves them! 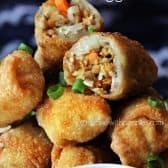 These egg rolls are filled with a pork and veggie filling and while the recipe doesn’t call for bean sprouts, I sometimes enjoy adding them as well! 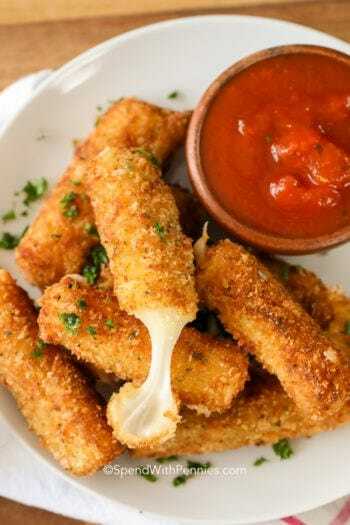 Once rolled, they are fried until crispy & hot however these can also be baked (however you won’t get the same crispy crust you find when you fry them). 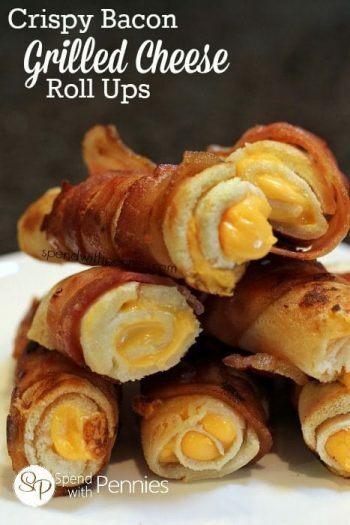 You will be able to make at least 12 egg rolls and possibly more. You may be wondering where to buy egg roll wrappers and the good news is almost every grocery store has them! Check the produce area (near the tofu products) or the freezer. If you don’t see them, just ask. Most egg roll wrappers come more than 12 per package I just make as many as I can until the filling runs out! 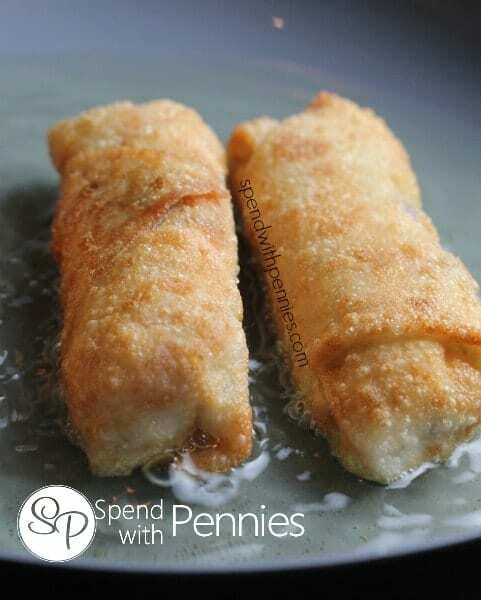 Egg Rolls are so easy to make! For the traditional egg rolls, I simply cook the filling and add it to the egg roll wrapper. Roll, fry and enjoy! While I add pork and veggies, you can add any fillings you like including beef or keeping them all vegetable. You’ll want to ensure you wrap your egg rolls well so the contents stay all tucked inside! Wrapping them is easy, I mix a touch of water/flour to make a glue to keep them sealed. Place the meat/coleslaw in the middle. Use your finger to spread a little bit of the flour mixture along the edge. Fold two opposite corners together to make a triangle, fold the sides in and then roll tightly. Seal the edges with the flour mixture. 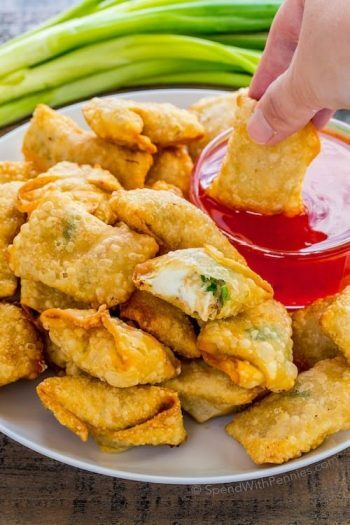 Did you know that egg rolls wrappers can be filled with pretty much add ANYTHING?! Really, the possibilities are endless, so use this as a guide and use your imagination! 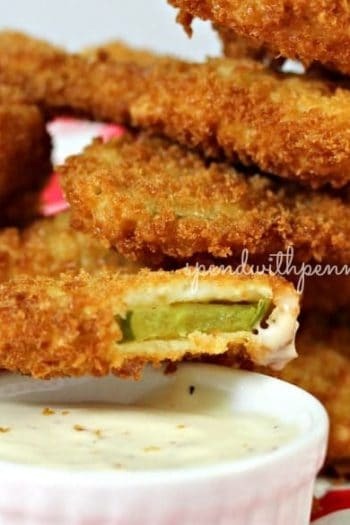 Love shrimp or mushrooms Throw them in and it just might be AMAZING! Have fun with these! Like most recipes with a crispy crust, these homemade egg rolls are best eaten right away when fried crisp. To reheat any leftover egg rolls, preheat the oven to 350°F and baked about 15-20 minutes or until heated through. 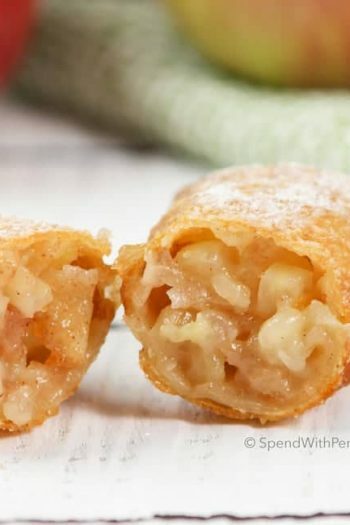 When we go for dinner, egg rolls is one of my favorite things to order! I had NO idea they’d be so easy to make at home! Cook garlic & chili flakes over medium heat until fragrant. Add remaining ingredients and cook an additional 3 minutes. 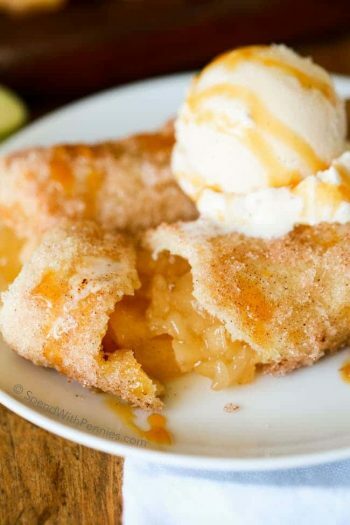 Remove from heat and refrigerate until serving. Over medium heat, cook pork, ginger, garlic, onion powder, chinese 5 spice (if using) and soy sauce until no pink remains. Set aside. Lay out one egg roll wrapper with a corner pointed toward you. Place 2 tablespoons of the meat and 2 tablespoons of the coleslaw mixture in the center. Use your finger to spread a little bit of the flour mixture along the edge. Fold two of the corners together to make a triangle, fold the sides in and then roll tightly. (Seal the edges with the flour mixture). Nutrition calculated without using oil for frying.